“There were so many ways that we were lucky,” says John Abruzzo, of his narrow escape from Tower One of the World Trade Center. September 11th started as a normal day for John, who worked on the 69th floor as an associate accountant for the Port Authority of New York and New Jersey. When the first plane hit the tower that day John, like others, rushed to the stairwell. However, evacuation for John would prove to be much more difficult than many other World Trade Center occupants. 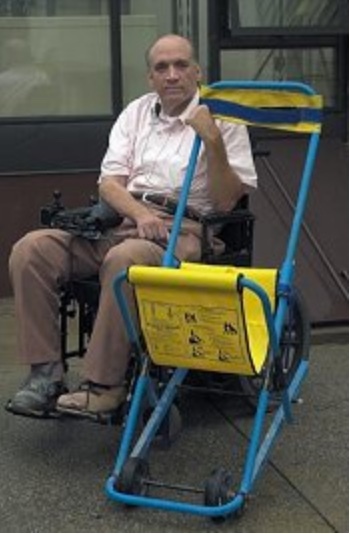 John is a C 5-6 quadriplegic who relies on an electric wheelchair for mobility. That day, many seemingly ordinary people did extraordinary things. ten such people were at John’s side. “There was no debate on whether I would be brought down or not by these people. It was more or less a collective decision,” says Abruzzo. With the use of a special evacuation mobility device designed for the physically disabled, call the Evac+Chair® Emergency Wheelchair, John was able to make an escape to safety. “It took us an hour-and-a -half to get down 69 floors.” Although it is designed to be guided by one person, three to four people handled the special evacuation chair while heading downstairs, rotating positions as necessary. In the first attack on the World Trade Center in February, 1993, John’s evacuation took six hours during which his electric chair was carried from the 69th floor to the 44th floor, where he was then transferred to a stretcher and finally exited the building. Shortly after the ’93 bombing, a number of products and systems were purchased to aid in the evacuation and life-safety of World Trade Center occupants. The implementation of these products proved successful on 9/11; lights stayed on while John and his friends evacuated, ventilation systems in the stairwells minimized smoke infiltration, and the evacuation chairs purchased by the Port Authority became a real life-saver. Several disabled people were successfully evacuated with the Evac+Chair® that day. John and his group exited the tower and were out of harm’s way ten minutes before its collapse. There were so many ways in which John Abruzzo and his 10 colleagues were lucky in their narrow escape from Tower 1 of the World Trade Centre. 11 September 2001 started as a normal day for Abruzzo, who worked on the 69th floor of the building as an associate accountant for the Port Authority of New York and New Jersey. When the first airplane hit the tower that day, Abruzzo, like others, rushed to the stairwell. However, evacuation for him would prove to be much more difficult than many other World Trade Centre occupants – Abruzzo is a C5-6 quadriplegic, who relies on an electric wheelchair for mobility. He recalls how, on that tragic day, many seemingly ordinary people did extraordinary deeds. There was no debate on whether I would be brought down or not by these people. It was more or less a collective decision, says Abruzzo. With the use of a special evacuation mobility device, designed for the physically disabled, called the Evac+Chair® Emergency Wheelchair, Abruzzo was able to make an escape to safety. It took an hour-and-a-half to get down 69 floors. Although it was designed for one person to guide it, three or four people handled the devices while heading downstairs, rotating positions as necessary. In the February 1993 World Trade Centre incident, Abruzzo’s evacuation took six hours, in which his electric chair was carried from the 69th floor to the 44th floor, where he was transferred to a stretcher and finally exited the building. Shortly after the 1993 bombing, a number of products and systems were purchased to aid in the evacuation and safety of World Trade Centre occupants, and Abruzzo and his colleagues exited the tower and were out of harm’s way no more than 15 minutes before tower 1 collapsed. The system provides a compact, instant wheelchair facility that can be operated by just one person to transport a passenger along corridors, around tight corners and down staircases to safety. Upon reaching stairs, the kickstand is folded away in seconds and the chair is ready to descend the stairway. The secret behind the smooth operation of the Evac+Chair is the interface of specially modified endless belting to the two supporting carriages. This produces a smooth continuous working braking/traction system that slows the descent proportionally to the weight of the passenger. Evacuation Chairs of Evac+Chair of North America placed in the 9/11 Museum for saving the lives of several disabled individuals during the World Trade Center, (Twin Tower) Attack in New York City. The original (over 30 years of experience) Evacuation Chair manufactured by Evac+Chair of North America, is inducted (placed) in the World Trade Center Museum, on display for saving the lives of several individuals that were confined to a wheelchair. Evac+Chair of North America is now part of American History for saving lives during the World Trade Center Attack in New York City. The Stair Chairs of Evac+Chair are of unique construction which makes it easy for anyone with any type impaired mobility (permanent and/or temporary) to be navigated up and/or down a staircase in time of need. Evac+Chair of North America is the company that originated the stairway evacuation chair over 30 years ago. More than six occupants were rescued to safety during the World Trade Center Towers attack on September 11, using the evacuation chairs of Evac+Chair of North America. The narrow profile, design and very light weight construction of the Evac+Chair stair chair means that its use as an evacuation chair does not interfere with the ascent and/or descent of first responders sharing the very narrow stairwell of the World Trade Center. The stair chair manufactured by Evac+Chair is engineered to maneuver smoothly and consistently using a patented continuous rotating V belt that ensures safety and allows the user to have total control of the chair’s descent speed down the stairs with relative ease, regardless of the passenger’s weight or size. Prior to the World Trade Center Twin Towers attack, the Port Authority of New York and New Jersey has purchased well over 125 Evacuation Chairs (Rescue Chairs) manufactured by Evac+Chair of North America. When the World Trade Center Twin Towers were attacked on September 11, 2001; Several disabled workers (with impaired mobility) were prepared to put the Stair Chairs by Evac+Chair of North America into action. These disabled workers were aided by fellow employees utilizing the Stair Chairs of Evac+Chair, including John Abruzzo, who in the aftermath contacted Evac+Chair of North America for a special thanks for the rescue chair (evacuation chair) by Evac+Chair of North America. By the time John Abruzzo, a C5-6 quad, had maneuvered his power wheel chair into the hallway, he saw only 10 of his coworkers–everyone else had already evacuated. A co-worker located one the the many EVAC+CHAIR’s located throughout the building and transferred John Abruzzo out of his new, customized Arrow into the Evacuation Chair of Evac+Chair of North America rescue device, which resembles a sled-like component that takes their place when going down stairs. The survivors and their rescuers reported that they were able to make their way down the stairs as firefighters came up without any interference. It doesn’t take a level of disaster such as the Twin Towers attack to keep in mind the importance of getting all occupants out of any multi-story building or large venue to safely. Anyone who needs assistance down a stair case for any reason, in any building, in any situation that requires evacuation, can be helped to safety with any model of the product line of stair chairs and/or rescue chairs (evacuation chair) made by Evac+Chair of North America. Evac+Chair of North America, manufacturers of Stair Chair Descent Devices (evacuation chairs or evac chair), as well as a complete line of evacuation system devices and peripherals, utilized to assist in the emergency evacuation of people with mobility needs from buildings or homes with more than one level. Although the product line of Evac+Chair is considered emergency evacuation chairs utilized for emergency stairway chair purposes only, however the staircase chairs can be utilized for several other real life scenarios as well. Any building and/or private home with a malfunctioning elevator and/or staircase, could easily make use of Evac+Chairs staircase chairs and/or rescue chair. Although the handicapped evacuation chair was utilized and successful during 9/11,evacuation chair was utilized and successful during 9/11, these stair chairs can be utilized for any free standing building with more than one floor. Evac Staircase Chairs by Evac+Chair of North America, are not only for people who are disabled, but also for people with sudden mobility impairment or temporary mobility impairment due to surgery or unexpected injury. You may have walked up the stairs at any given venue and/or building with more than one floor, however you experienced a sudden injury and now faced with impaired mobility to the extent you can not walk down the stairs. This would include, but not be limited to; heart attack, seizure or even a major asthma attack. Suddenly, you are faced with challenge of staircase navigation maneuverability. Any building consisting of more than one level, should possess an emergency stair chair by Evac+Chair of North American in place for that very reason. Being prepared for such an event can save time which has been proven to be a factor in saving lives.